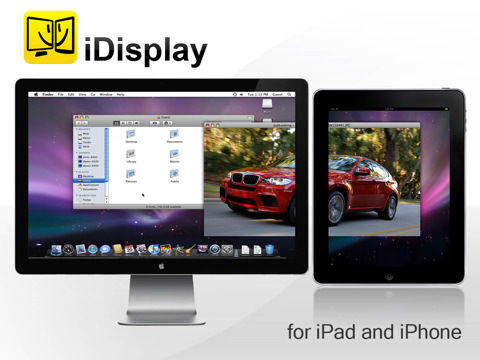 iDispaly is an iPad app that is developed and marketed by Shape Services as a utility that extends your MAC or PC display onto your iPad (or iPhone) so you can use them as a second monitor source. While the idea behind this app is great, iDisplay’s actual perfrmance is nothing close to what you might expect. We tested this app using a MAC and an iPad and had issue after issue, crashes on both the MAC and the iPad, and finally had no choice but to uninstall in order to get back to a stable state, which in itself was a drag as well. The iDisplay app sells for $4.99 in the App Store and is aimed at increasing your productivity and adding additional view and work room. To get this app to function you need both a host app on your iPad or iPhone and the server app on your MAC or PC. The setup requires you follow specific steps manually such as going into your settings and turning off mirror displays. The issue here is that unless you already have dual displays, your computer won’t have that option for you to disable. It appears the developers have not tested this app much on a MAC perhaps to iron out these kinks. After you install the server iDisplay package on your MAC, then you’ll have to go and buy the app and open it on your iPad. From there you’ll see your MAC listed. Tap on the name, confirm the connection on your MAC to get started. After this was done, had to wait about 1 minute for the iPad to start displaying the default MAC wallpaper on the iPad. Then you can move your mouse over to the iPad area and you would expect to see it there. But with the sluggish lag it took about 5-10 seconds each time for the cursor to even appear on the iPad, needless to say dragging actual apps over to the iDisplay window and seeing them update was absurdly unusable. Finally, deleted the iDisplay app from the iPad and posted the 1 star rating. Now trying to figure out why we had to pay $5 for this stressful experience. If you’re in the market and looking at iDisplay, our recommendation is to spend your money elsewhere. At least until some major improvements are made. AppSafari review of iDisplay was written by Joe Seifi on April 4th, 2010 and categorized under App Store, Developers, iPad apps, Utilities. Page viewed 6979 times, 1 so far today. Need help on using these apps? Please read the Help Page. I agree 100% with your review and rating on this app. When I saw all the cool writeups on othersites lauding this app, I spent the $5 and was just as quickly disappointed. Very laggy, un-usable performance. Does not meet the expectations of what it says it does at all. Save your money until they fix this – if they fix it. How can I get my screen back? This useless f___ s___ app killed mac MacBook Pro screen! I can only use it with iPad resolution! This is insane! Those programmers who made this sh_t should be crucified asap! iDisplay was about as effective to me on OSX Lion as a virus. It totally destroyed the display settings I had, overriding the System Preferences settings. I could not find iDisplay to quit the app, and there was no UI for it. I had to reboot in Safe mode, hunt down the app, and remove it. Sometimes when an idea is better tested and more user-friendly will it become successful. Great idea, but poor development/testing and Apple didn’t catch it.